After the cup exploits last week against AFC Sudbury, it was back to earth with a very big bang, complete with a “Kiss Me Quick Hat” on Saturday as five second half goals sunk the Rooks at Margate. The journey back from a day out at the seaside on a normal trip is depressing enough, but one in the middle of January when you have been spanked 5-1 is possibly up there with a trip to the dentist or one of those “can we have a quick word in the cubicle” conversations with customs at the airport. However, all was not lost. The Rooks had to chance to show their “bouncebackability” with another home cup tie. And not just any old cup tie. One against Eastbourne Borough, sworn enemies, deadly rivals and pretenders to the title “Best Non League team in Sussex”. The Sussex Senior Cup is a strange competition. The bigger clubs (i.e Crawley Town and Brighton & Hove Albion) rarely take it seriously, yet every year it is the same story. The former seem to be eliminated early, the latter in for the duration despite fielding essentially a reserve team. Last season Lewes lost in the quarter finals at home to Brighton & Hove Albion, thus denying themselves the chance to reach the final, which was played at The Amex. This year, wins over Wick and East Grinstead had sent up a mouth-watering tie with Eastbourne Borough. The winners would join Crawley Down, Whitehawk and the winner of the BHA v Bognor Regis Town game in the draw for the semi-final. Brighton & Hove Albion had reached the final of the last five competitions, winning four. In fact it was Lewes who were the last team to break this run back in 2006 when they beat Horsham. 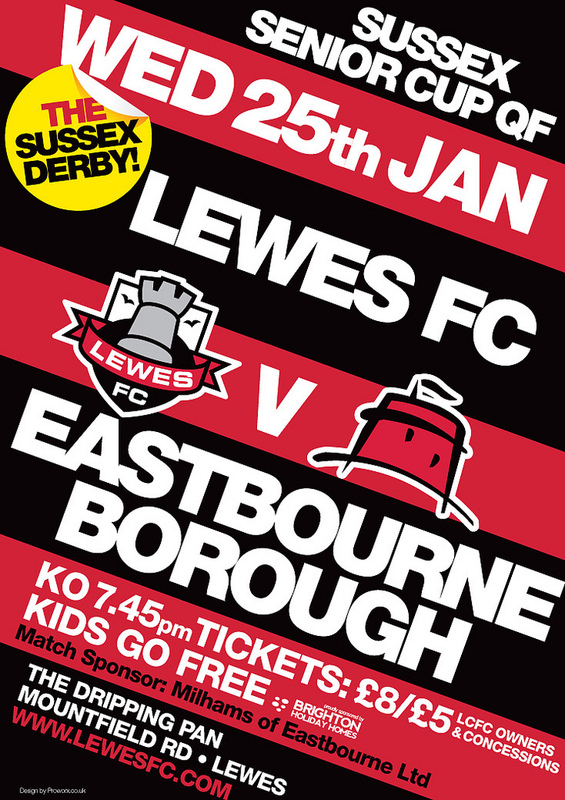 Lewes hadn’t met Eastbourne Borough since New Year’s Day in 2009 when they met in the Conference Premier. Both teams had been promoted from the Blue Square South the previous season – Lewes as winners and Boro via the play offs. Those two games over the Christmas period had attracted near 5,000 fans. How both would love half of that now. The clubs have lived almost parallel lives in the past season. 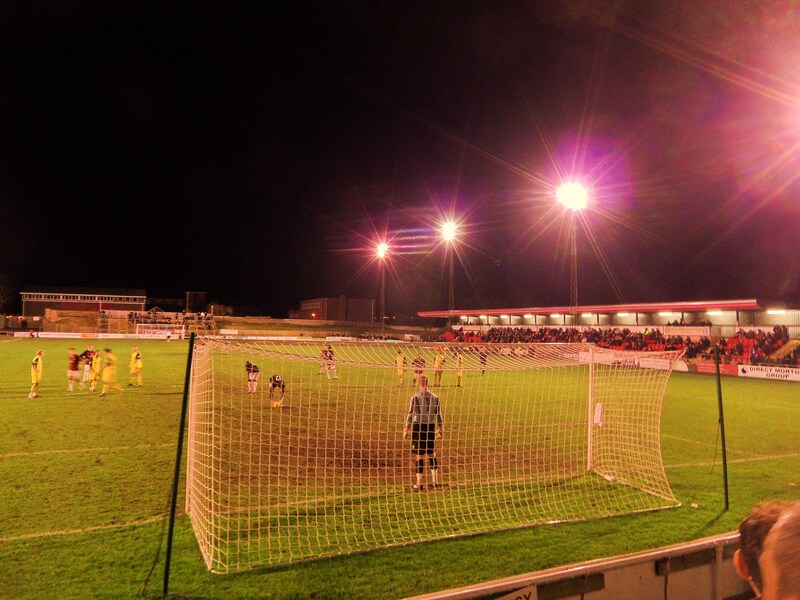 Both were relegated last year – Eastbourne Borough from the Blue Square Bet Premier, and Lewes from the South division. More recently both had become manager-less as Eastbourne decided to part company with their management team who in part had been at the helm for over a decade. But whatever the circumstances both sets of fans wanted to get one over on the “old enemy”. We were expecting a decent crowd. Obviously this was a “minor” cup competition in the eyes of many fans and we would normally only expect a few hundred. However, the draw of the derby-day atmosphere was certain to bring a few more through the gate. But perhaps the real compelling event would be the lure of the Lewes burger. Last week The Guardian Food and Drink supplement no less had spoken about the Lewes Organic burger being “the best fast food he has come across so far. The club spends more on its chefs that it does on players”- The Guardian Food and Drink – 18th January 2012 Lewes 1 Eastbourne Borough 2 – The Dripping Pan – Wednesday 25th January 2012 For 94 minutes this was a classic cup tie full of passion (on and off the pitch), hard tackles, goal mouth incidents and a decent atmosphere created by 637 fans. And then, the curse of the Dripping Pan struck again. Just as we had seen so many times (in fact twice already in January) we concede a late goal. Not quite a Horsham late goal, but still deep into injury time. Unlike the Horsham game this one was the knock-out box. With the game poised to enter Extra Time, Eastbourne Borough took all of the spoils and dumped Lewes on their backsides and out of the Sussex Senior Cup. Pre-match had been a juggling act for new boss Simon Wormull. I arrived at the group at 4pm to find him busy on his phone trying to work out the formation. With our only goal keeping option, Rikki Banks, on loan from Eastbourne Borough and thus not able to play, he had managed to pull in a young Polish keeper to make his debut (Pawel would later dislocate his finger in the warm up, yet in true British Bulldog spirit simply taped it up and carried on playing). He brought in a number of the impressive youth team players and leading from the front, named himself on the bench. The spirit of the team of 2008 was not yet dead. The opening exchanges were fast and frantic. Eastbourne had the better of the opening exchanges but then the Lewes midfield got hold of the ball, and Mel Kamara started powering forward from midfield. In a space of a few first half minutes Michael Malcolm showed that when luck is not on your side, nothing rolls for you. First he powered a header against the inside of the post, with the Eastbourne keeper stranded and then he saw his goal-bound toe poke trickle slowly towards an unguarded net only for it to be cleared by a last gasp sliding tackle. Half time – all square in love and war. The Eastbourne fans had come in good voice, although some of them had obviously brought the “Football Fans song book from Green Street” with some of their chanting. Chaps – it’s a Sussex Senior Cup game not Millwall v West Ham. A chant of “No one likes us” made me chuckle as I recalled an away game back in April 2009 when they played at Altrincham which I saw where the home fans all clapped the 13 supporters who had made the trip on a cold Tuesday night – see someone does love you! Ten minutes into the second period Eastbourne took the lead when a misjudged throw from the Lewes keeper fell straight at the feet of Matt Crabb and he sent the ball back over his head into the net. Lewes doubled their efforts with the impressive Harding always looking dangerous and Malcolm seeing efforts blocked by last gasp defending. Finally Lewes got their reward when Nanetti was brought down by the Eastbourne keeper Masters. With no covering defender and Nanetti not going away from goal it was bizarre that the referee (interestingly sharing the same unusual surname as an Eastbourne player) did not even book the keeper. Good job Hansen et al didn’t see it as we would still be discussing it now. Booth stepped up and dispatched the millionth penalty of the season for Lewes and it was game on. We were in for a frantic final period with both teams having chances but failing to really test the keeper. Four minutes of injury time were announced, and with the clock showing 93:47 Ciardini’s sliced clearance fell to Ben Watson who thumped the ball home. Lewes can feel hard done by to lose so late on, but in these games there always has to be a winner. This was one of the best performances of the season without a doubt and with more luck the scoreline would have been more favourable. But that is football. This is a team in transition and most of the fans appreciated the spirit, effort and hard work of the players as they made their way off the pitch. The Sussex Senior Cup will just have to wait another season.